Where numbers and politics meet. 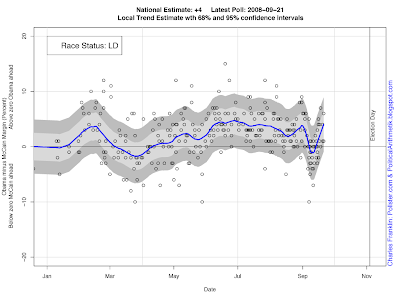 Obama has now recovered his lead in national polling, rising at or above his post-DNC, pre-RNC level. This sharp turnaround erases the very sharp pro-McCain/Palin convention bounce we saw in early September. But the Obama recovery is not concentrated in Democratic states. As with the McCain advantage, this turn is visible in all three types of states-- Red, Yellow and Blue. The biggest recovery is actually in the Red states, where McCain enjoyed his biggest bounce. Those states are not back where they started, or even a shade less pro-McCain, but they are a far ways from being "close". The states we have classified as tossup or leans (what I'm calling yellow here, though on the map leans are light red or blue) have also seen a significant Obama recovery. The range of movement is rather modest, but the roughly three point McCain gain has now been balanced by a 3+ point Obama recovery in these most contested states, putting Obama up by just over a point. Dem states showed a small move to McCain and have now seen an Obama recovery, though with a one point fall off most recently. 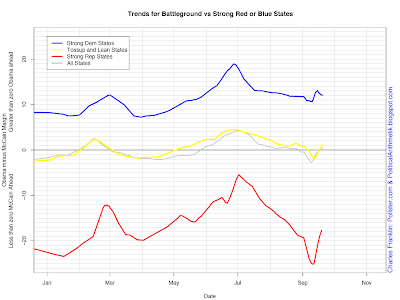 New Interactive Charts at Pollster.com! Scroll down for links to Basic Trends. I am co-founder of Pollster.com and founder of PollsAndVotes.com. I am also a professor of political science at the University of Wisconsin, where I teach statistical analysis of polls, public opinion and election results. Data visualization is central to my approach to analysis. Email me!